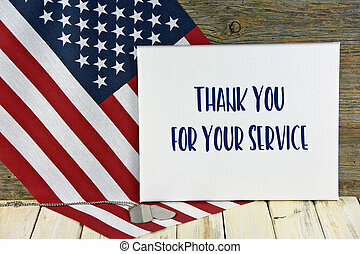 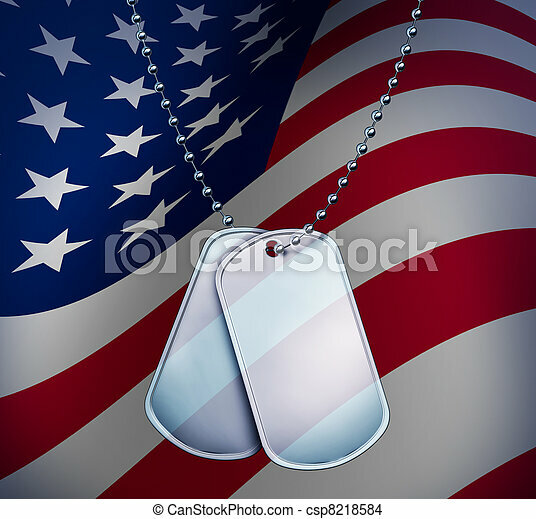 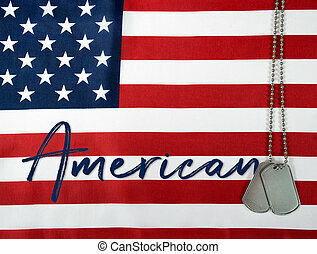 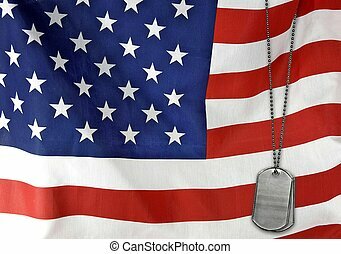 Dog Tags with a proud American Flag with blank metal and beaded necklace on red white and blue symbol of the American military identification of soldiers for emergency medical attention for wounded and fallen heroes. 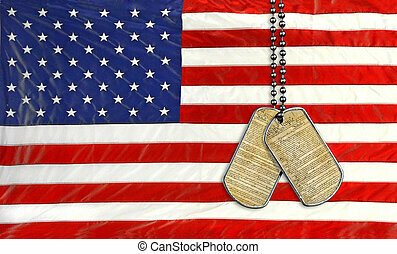 Miltiades dog tags on an American flag with United States constitution. 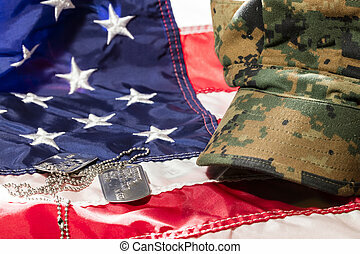 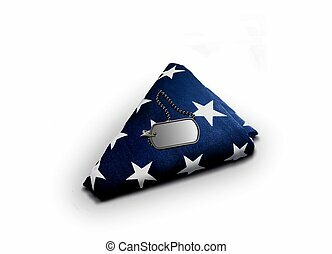 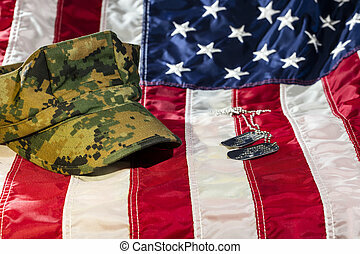 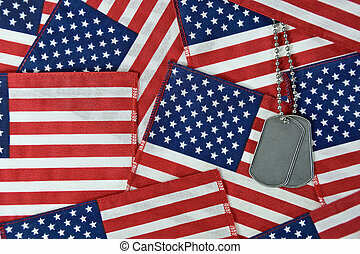 Military dog tags on American flag. 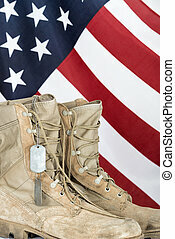 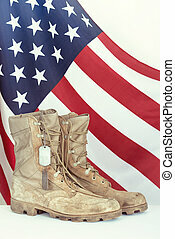 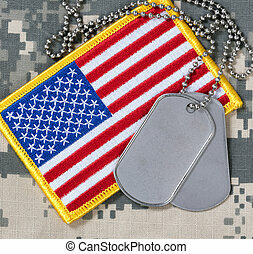 American flag and dog tags. 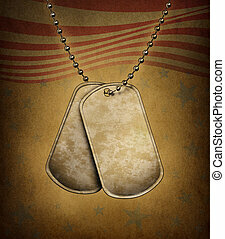 Wooden desk background. 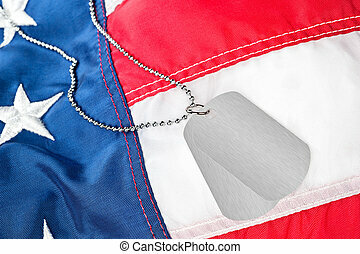 A pair of blank dog tags on an American flag. 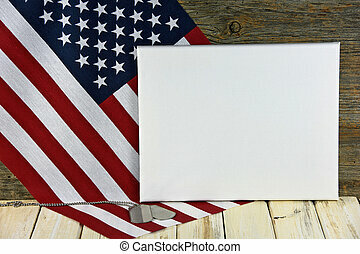 Tags are blank for placement of copy. 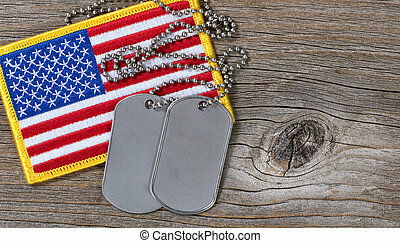 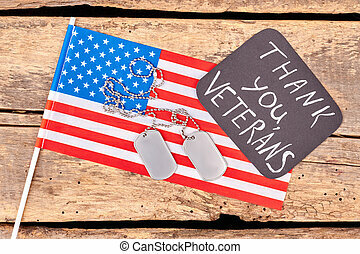 Dog Tags on an old grunge texture with the American flag theme made of blank metal with beaded necklace as a symbol of the military identification of soldiers for emergency medical attention for wounded and fallen heroes. 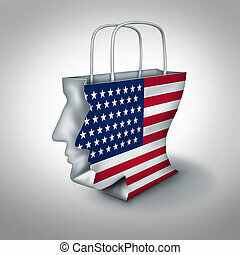 American consumer concept as a shopping bag shaped as a human head with a United States flag as an economic symbol of retail fashion industry or dealing with spending and credit debt. 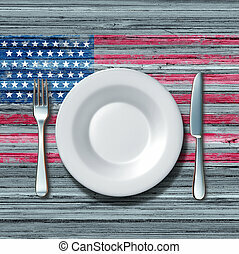 American cuisine food concept as a place setting with knife and fork on an old rustick wood table with a symbol of the flag of the united states as an icon of traditional family eating in america. 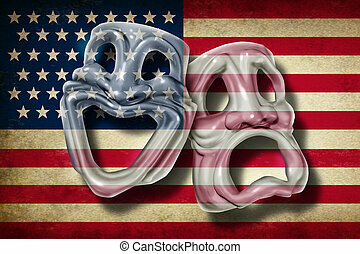 American theatre and Broadway performing arts concept with an old flag of the United States on a comedy and tragedy mask representing the rich cultural tradition of classical cinema and movie making in America. 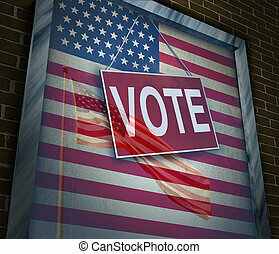 American vote concept and United States elections symbol as a window with a US flag with a voting sign as an icon for presidential or government political tradition of democracy to choose a candidate for a new term. 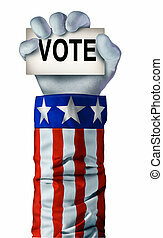 American election hand concept with an arm wearing an United States flag jacket holding a card with the word vote as a casting ballot symbol for president or political poll icon. 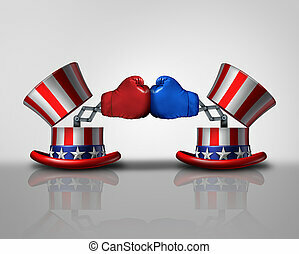 American election fight and political strategy concept for campaigning for votes as an open uncle sam top hat decorated with the flag of the United States and a surprise boxing glove emerging out as an icon of debating issues. 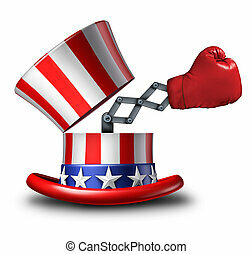 American election fight and political violence concept for campaigning for votes as an open uncle Sam top hat decorated with the flag of the United States and a surprise boxing glove fighting an opponent from the left and right. 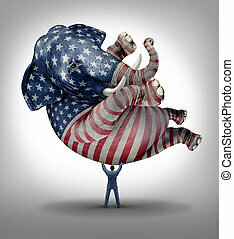 American republican vote election leadership symbol as an elephant with a painted flag of the United States with a person lifting up the animal as an icon of the conservative values in a voting campaign for president senator or congressman. 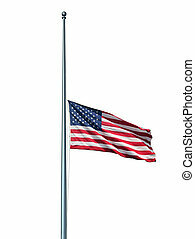 Half mast American flag isolated concept with the symbol of the United States flying at low level on the flagpole or staff on a white background as an icon of honor respect and mourning for fallen heros. 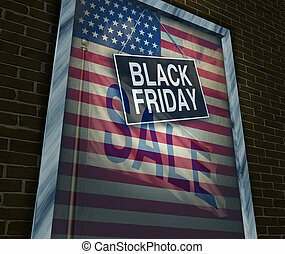 Black Friday holiday sale banner sign on a store window with an American flag reflection to celebrate the season to shop for low prices and discounts at retail stores offering special buying opportunities. 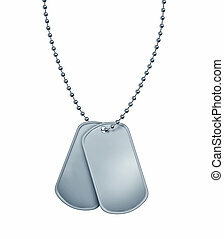 Dog Tags made of blank metal with beaded necklace isolated on white as a symbol of the American military identification of soldiers in a combat zone for emergency medical attention for wounded and fallen heroes. 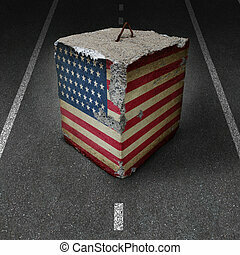 United States government shutdown roadblock obstacle and barrier business concept with a huge cement or concrete cube with an old American flag blocking a road or highway as a symbol of political gridlock resulting in financial system shutdown. 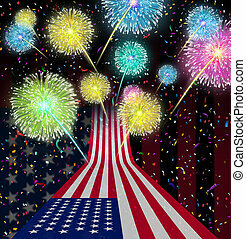 Fourth of July party as an American celebration and national Holiday for independence day as a USA flag flying up to the a sky with festive fireworks display and confetti as a symbol of United States traditional culture. 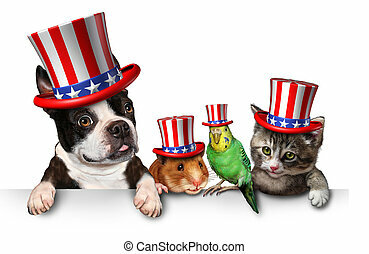 Independence Day pets celebrating the United States fourth of july holiday with a dog cat bird and hamster wearing hats with the american stars and stripes.